The best offensive night of his career still had John Tavares wanting more. Mainly on the defensive side of things. 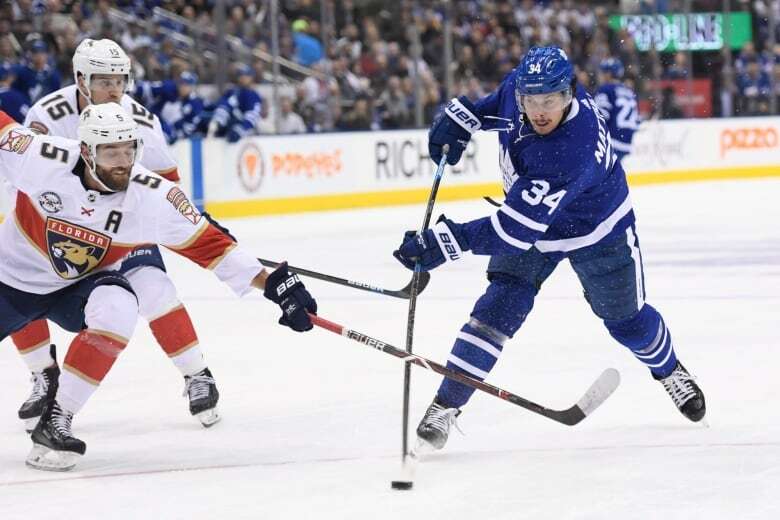 The star centre recorded his first four-goal game in the NHL as the Toronto Maple Leafs downed the Florida Panthers 7-5 on Monday. Tavares, who signed a seven-year, $ 77-million US contract with the Leafs in free agency on July 1, now has 45 goals on the campaign — the most ever by a player in his first season with the franchise. "Nice to get rewarded like that. It's a good feeling," said the 28-year-old. "I still feel like we can be a little better with some of the opportunities we gave up and eventually went in our net." Tavares, who came in with nine hat tricks in his career since being drafted first overall by the New York Islanders in 2009, jumped into second in goals in 2018-19, three back of Washington Capitals sniper Alex Ovechkin. The line of Tavares, Zach Hyman (one goal, two assists) and Mitch Marner (three assists) combined for 10 points as Toronto (45-25-6) exploded after scoring just seven times over the club's last four games. Hyman hit the 20-goal mark for the first time, Marner reached 90 points, and Tavares is at 86 points to tie his personal-best set in 2014-15 with six games left on the schedule. Patrick Marleau and Jake Muzzin provided the rest of the offence for Toronto, while Morgan Rielly and William Nylander added two assists each in front of a crowd of 19,125 at Scotiabank Arena. Frederik Andersen made 31 saves for the Leafs, who are five points back of the Boston Bruins for second in the Atlantic Division and almost assured of meeting their rivals for a second straight spring in the first round of the playoffs. 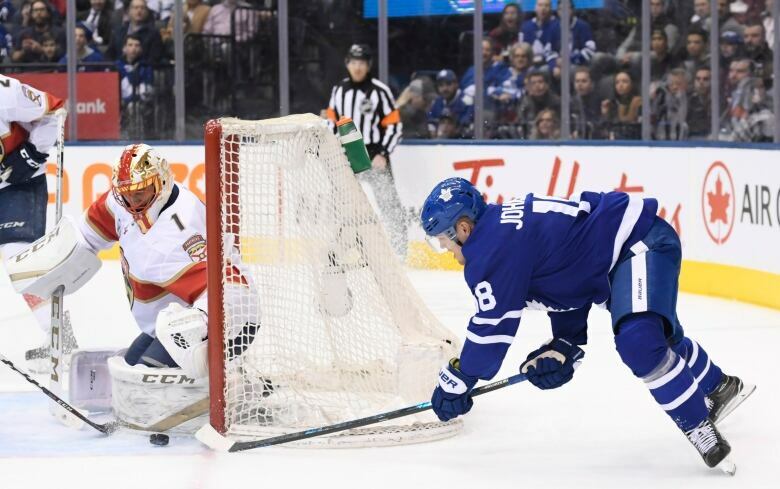 It wasn't all smiles in the Toronto locker from, however, as the Leafs led 4-1 and 6-2 before letting the Panthers to creep within striking distance late. Jayce Hawryluk scored twice and added an assist for Florida (33-31-12), while Jonathan Huberdeau, with two, and Mike Matheson had the other goals. Evgenii Dadanov and Mike Hoffman each had two assists. Rookie netminder Sam Montembeault allowed two goals on four shots before getting the hook just over four minutes into game. Roberto Luongo, who was scheduled to get the night off with the Panthers set to visit the 39-year-old's hometown Montreal Canadiens on Tuesday, made 28 saves in relief. "It's embarrassing the way we've played the last three, four games," Florida defenceman Aaron Ekblad said. "It's unfortunate." Toronto entered play 2-4-1 over its last seven, including Saturday's 2-1 overtime loss at home to the New York Rangers, but had improved defensively over a recent 1-1-1 stretch after surrendering 23 goals in four prior outings over a six-day span from March 11 to 16. The Leafs got on the board at 2:06 of the first period when Marleau — suiting up for the 1,651st regular-season game of his career to tie Chris Chelios for sixth all-time in the NHL — beat Montembeault on the shortside for his 16th goal of the season, and second in his last 13 outings. Tavares scored his first on the power play 11:05 when he snuck a between-the-legs backhand through Luongo's five-hole from the lip of the crease. Hawryluk got Florida on the board at 13:23 when he tipped his sixth past Andersen, but Tavares added his second just 1:19 later when he lost his check in front and tapped Hyman's pass beyond a helpless Luongo. Matheson fired his eighth through a screen at 16:25 to give the Panthers, who came in with a minuscule hope of making the playoffs, a bit of life. But Tavares made it 5-2 on a rebound off the rush at 5:51 of the second to complete his hat trick after Rielly took the initial shot as hats rained down from the stands. Tavares added his fourth of the evening to make it 6-2 on another tap-in at 3:57 of the third. Huberdeau got his 24th at 5:34, but Hyman was left all alone in front to make it 7-3 with his 20th at 6:51. Huberdeau ripped his second of the night on the power play with 6:24 remaining on the clock before Hawryluk scored his second of the night with 2:24 remaining to make it 7-5 to make for a bit of an uncomfortable finish.